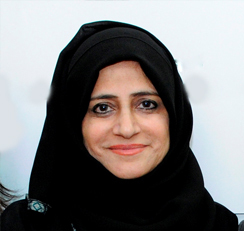 Amna has a wide experience over twenty years in Hospital Administration. She successfully completed “Training of Trainers (TOT) Sphere Project: Humanitarian Charter and Minimum Standards in Humanitarian Response in January 2011 and has four years of experience as Sphere Trainer. Amna continuously provides training to employees of medical sector, local and federal government organizations especially UAE Red Crescent. Participated as one of the trainers in “(TOT) Sphere Project: Humanitarian Charter and Minimum Standards in Humanitarian Response held in Dubai, UAE and Jeddah, Kingdom of Saudi Arabia. Recently, she conducted child protection workshop (Minimum Standards for Child Protection in Humanitarian Action) to Pediatric Physicians, Psychologist and Social Workers. Conducted a total of 25 trainings with 600 participants .